It maybe part of everyday life, but in fact nobody knows what time is, or how it works. Time seems to be closely related to space, and it’s possible that space and time are different ways of looking at the same thing. Some people think that time started with the Big Bang at the start of the universe, and that it will end when the universe collapses, though nobody knows when that will happen, or even if it will happen. If time started with the Big Bang, then that was about 13.7 billion years ago! One way that time is related to space is that both of them depend on how fast you are moving. If you could travel very fast in a spaceship, close to the speed of light (186,000 miles a second), you would find that both space and time behaved very differently than they do in our ordinary lives. Time would pass much more slowly for you in your spaceship than it would for your sister back on Earth. When you got back, you might find that while you had only gotten one year older, she had gotten seven years older. While you were in your fast spaceship, space would look different to you too. As you flew by a round planet like Neptune, it would look to you like a long oval instead. These changes in time and space apply even at the slow speeds we can really travel at, but they don’t change enough for you to notice. So for practical purposes today, we can treat time and space as if they were the same for everyone. But if we ever learn how to go really fast, close to the speed of light, then we will have to think about space and time very differently. To measure time, we can use anything that repeats itself regularly. One example is the dawn of a new day (as Earth rotates on its axis). The study of time measurement is horology. 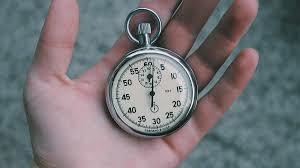 Time might feel like it is going slowly when you’re doing something boring but scientists believe that if you could travel as fast as light, time really would seem to slow down! Light travels so fast that it can go around the whole planet Earth 7 times in a second. Making a sundial – one of the oldest ways known to measure time. Just a minute – all you’re going to need for this is a clock that counts seconds. The idea is to try and guess how long a minute is – without looking at the clock!